NOTE: The final in a series of projects completed for a new local newspaper publication. To read the first post in the series click here. … A mix of vintage metal seating came next, including: A two-person ribbon settee in green; a pair of matching strap chairs; a stylin’ pair of rusted steel swivel chairs with conical mesh bases and curved backrests. I improvised a bench out of a painted truck step topped with square cushions. To spare visitors a sprained ankle, I stacked concrete elements (including a beehive) to fill in space between the pad and a nearby retaining wall. 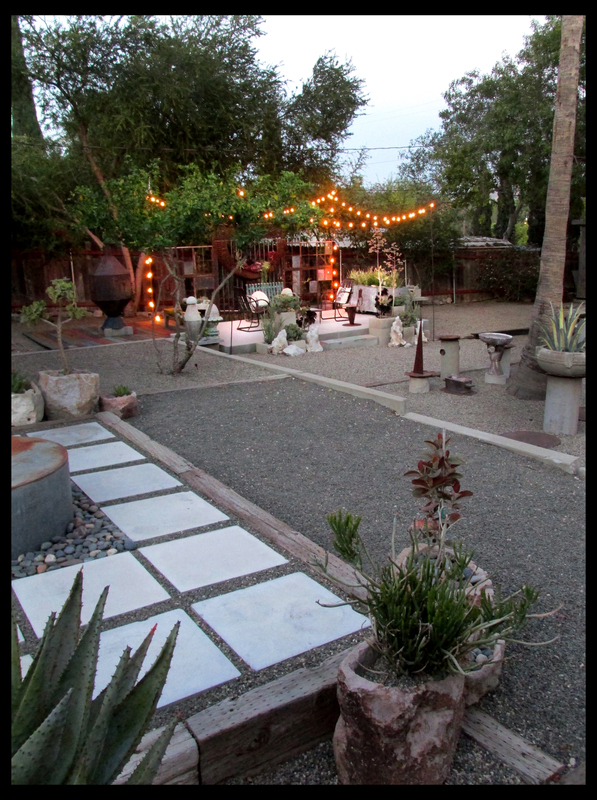 The final element to transform my concrete pad into a comfy lounge was a 100-foot length of string lights. To hang the lights, we took four 12-ft lengths of thick rebar and placed them into the ground at the four corners of the pad; hooks secured with industrial strength velcro finished off the top of each pole. We then simply strung up the lights, hook-t0-hook, until they ran out; amazingly they fit exactly! Flipping the switch that night for the first time, I felt the pad was complete, and completely transformed; it was exactly what I wanted it to be. In the opposing view the BBQ/smoker looks great on the painted wood floor. Note the galvanized carts in the foreground. Of course the daytime view is pretty nice, too … It’s a great place to read or simply nod off in the afternoon breezes. Oh, in case you were wondering, that lovely bit of curved rusted steel affixed to the back wall is a very old wheel guard from some sort of gigantic farm machine. Scored during a picking expedition somewhere in the midwest, it was spotted by me in a back stall at the always-dependable Treasures N Junk in Ontario. I imagined it mounted arch-like over the back wall’s center gate, where it would serve as a focal point … I quickly scrapped that plan, however, once I saw it upside-down against the gate. 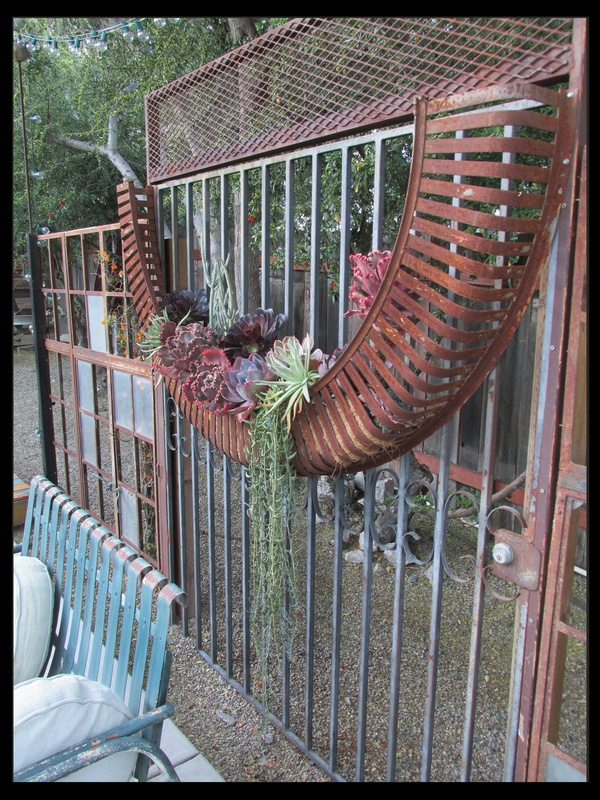 Not only did it fit the width of the gate perfectly, but like a wide, U-shaped grin, I could see it functioning as a planter — a succulent planter! I followed my standard planter-conversion formula to achieve this: I lined the lowest part of the U with metal mesh front and back and secured it with wire; in the resulting channel, I added a layer of coco-fiber matting, followed by easy-drain cactus soil mix. Lastly, I installed an attractive array of succulents in the new planter/basket. 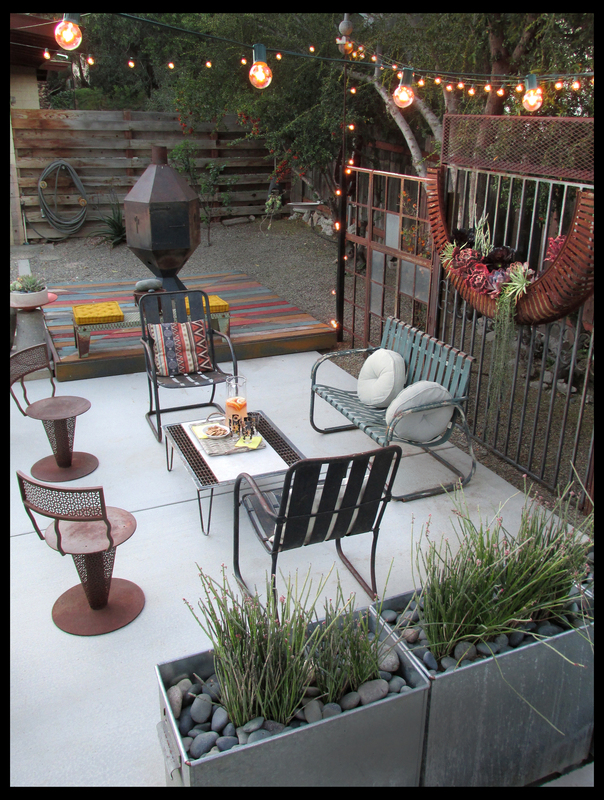 More than an arch on the back wall, I love how the newlplanted wheel guard completes the lounge in grand Rancho style. A neighbor dropped by recently to faux whine over the fact that we’d had a party the night before and neglected to invite him … I was momentarily confused because we hadn’t. I then realized he’d seen the lights in the backyard and just assumed they signaled a fiesta. I guess I don’t really blame him for feeling left out, even from behind the fence the Rancho’s lounge looks like a hotspot. “Because I’m happy — Clap along if you feel like a room without a roof” … That lyric from Pharrell William’s giddy pop hit expresses how I feel about my completed lounge — and my garden, really — now that it’s finished. Under the stars at night — alone, with Paul, or with friends — my room without a roof makes me very happy indeed. Thanks, readers, for following this 6-part series. Thanks again, too, to all who assisted in physically making these projects and spaces come to pass: I could not have done any of it without you! It’s an amazing blessing to know that I have so many willing hands (and backs) supporting me and my ideas. The newspaper publication in which the Rancho will appear will be inserted in the Sunday, April 27th issue of the Riverside Press-Enterprise. The pics show everything so well. I did enjoy your night time look the evening I was there. Sure made me think about what I’m going to be doing here. Just can’t quite make up my mind. Or find the energy necessary. Have you any ideas for me? The huge swag with succulents is what makes it for me. Otherwise, I think the angles would be too prominent, but the scale of the one giant curve is enough to balance it. A feast for the eyes!!! YOU amaze me! I’m sure I’ve said it before but you’ve really outdone yourself this time…wow! I love everything about this spot. I saw the completion on Paradis Express and had to rush here for the commentary. After all those months of being stymied, it’s amazing what a little deadline pressure produces. The laundry carts are fabulous planters. Incredible how you will these disparate objects into a space with such coherence and inevitability. Bravo! Awesomely wonderful. Honestly, you have no idea how inspiring your garden is and how much of an inspiration this series has been. I have a big, rusty ore-cart from an old mine [family’s had the cart for three or four generations] and am now trying to figure out how I can get it over a wall and into my back yard… Meanwhile, I need to cruise Craigslist — those galvanized carts of yours are terrific. Thanks so much for sharing your garden and its evolution! Difficult to see which area or item that grabs me the most, as I enjoy that’s been done with so much. 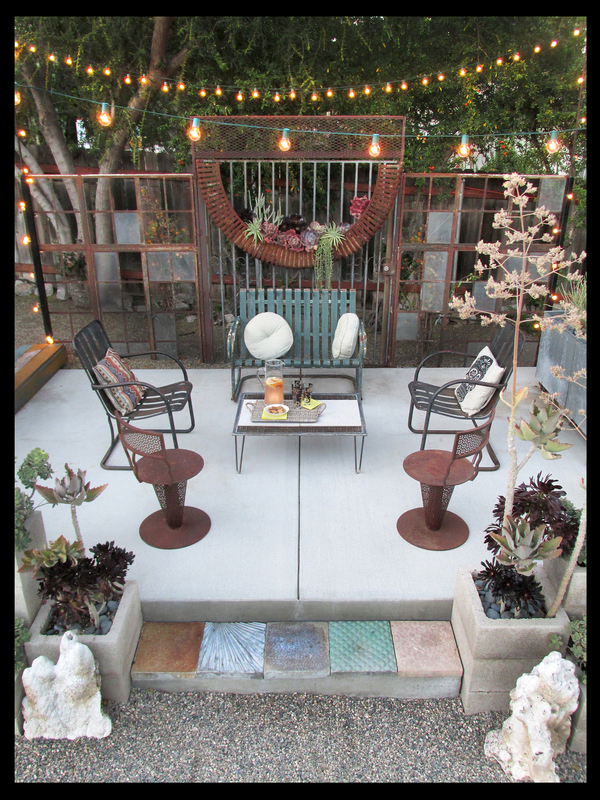 I’ll just say the way these spaces are expanded is refreshing and maybe quite the model for what my patio can become in my different ecoregion or climate. Now, I need to look at more of your past posts to see where you came from and where you might be going! I like that you’re so analytical in your approach to my garden, DD. Share your conclusions! Reuben…I have been having problems with my computer, but i’m back now. This project is wonderful and a great space for fiestas. I especially like what you’ve done with the metal swag. My neighbors also think I’m having a party when the lights are on my rancho. So love checking in on your most recent endeavors. This one was particularly enjoyable. Love the rusted industrial aesthetic, and you are a master at composition. Inspirational! You are an artist with scrap metal and space, Reuben. This garden room is, in every way, inspiring. Wow! It’s interesting too to hear about the creative process. Thanks so much for sharing. 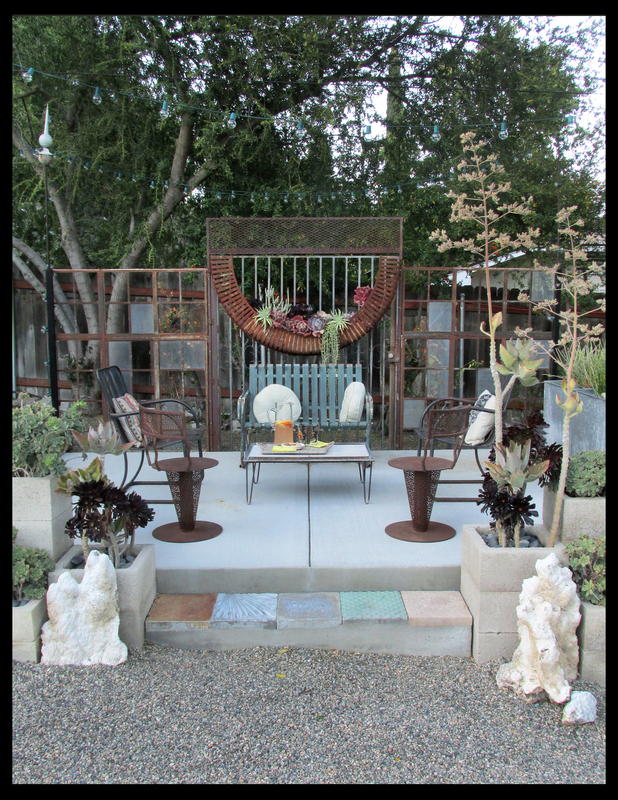 I just found your blog and I love love your garden! I have a question – how did you secure the gate and windows into the ground? I have several old large metal casement windows that I would love to use in the same way, but I’m not sure how to attach them to the ground in such a way that they would be sure not to fall over. 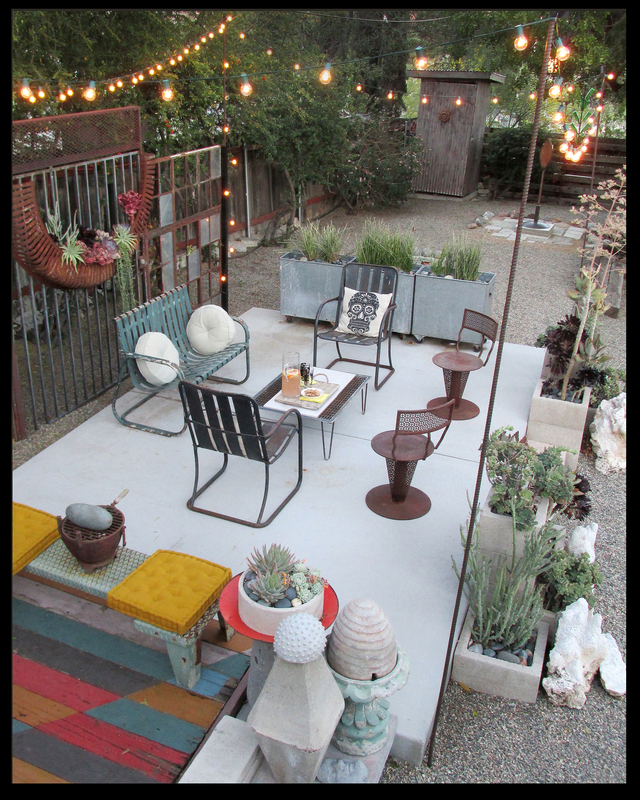 Again, love your space, your re-use of materials is an inspiration! Hi, Melba, thanks for your comments. Luckily I have a brother-in-law who’s very adept at securing the often unusual elements of my garden schemes. In the case of the windows and the uprights who support them; he dug down a few feet for the uprights pouring concrete into the holes to secure them … he also, at some point, made sure they were both plumb and level. Once the concrete had cured he screwed the windows onto the uprights at regular intervals to render them permanent. Visitors to the garden are always covetous of this window backdrop and I can’t say I blame them, I would be too!